MCALLEN, Texas — The Border Patrol released 250 migrants here on Tuesday and Wednesday and expects to free hundreds more in coming days because there is no room to hold them. Normally, the agency would transfer the migrants to Immigration and Customs Enforcement to be “processed” and in many cases placed in detention facilities. But officials said Wednesday that a recent influx of Central American families has led to a severe shortage of space. 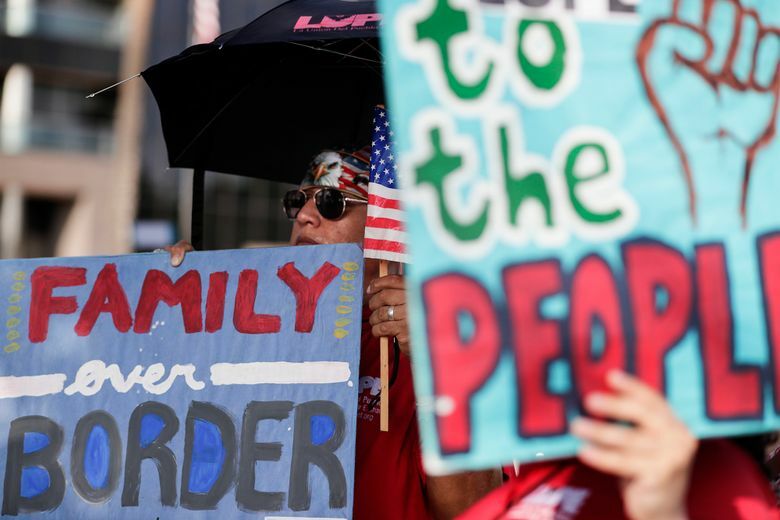 Immigrant advocates suggested the releases were intended to sow confusion at the border and further President Donald Trump’s argument that there is a national emergency there. He pointed out that the federal government has dealt with bigger influxes of migrants in the recent past. A Border Patrol official — who spoke on the condition that he not be identified — denied that the release was a political stunt and said crowded facilities threatened agents and migrants. The agency plans to make similar releases along other parts of the border, he said. In February, the Border Patrol caught 66,450 migrants, a 38 percent increase from January and one of the highest monthly totals of the last decade. More than half of those arrested were parents and children, and 40 percent of those were in the Rio Grande Valley. The number of families arriving in the Rio Grande Valley sector since October has jumped nearly 210 percent over the same period in the last fiscal year, according to Customs and Border Protection reports. Still, migrant apprehensions are far below levels seen for decades until the mid-2000s, when they reached more than a million per year — mostly adult Mexican men — before falling dramatically. That hasn’t stopped Trump from declaring a national emergency at the southern border in order to tap into billions in federal funding for his long-promised border wall. Three ICE family detention centers in Texas and Pennsylvania — with more than 3,000 beds — have been full for a month, said an agency official speaking on background. “It reached a breaking point,” the official said. Last week, ICE unions sent a scathing letter to Trump calling for Border Patrol to release migrants directly, to clear space. This week, the Border Patrol began doing just that, with 50 migrants released Tuesday and another 200 released on Wednesday, according to Carlos Diaz, a spokesman for the agency. All were given notices to appear in court and were turned over to Catholic Charities of the Rio Grande Valley, which operates a local respite center. Sister Norma Pimentel, who runs the shelter, said 600 migrants arrived Wednesday, joining 900 who were already there. Three additional sites were opened to handle overflow. Pimentel said the Border Patrol officials had given her warning of the release, saying their central processing center had filled with 5,000 migrants, some of whom they planned to start dropping at the downtown bus station. She and McAllen Mayor Jim Darling said they persuaded them to bus migrants to the shelters instead. “I don’t understand why they let the numbers go up so high,” Pimentel said. The main shelter’s halls were standing room only. Migrants who had not bathed in days clutched manila envelopes of immigration court paperwork. Volunteers helped them arrange bus tickets to join family or friends across the U.S., then took them to the station. Some migrants said they and their children had been detained by the Border Patrol in crowded, chilly cells they called hieleras, or iceboxes. Others said they were held for nearly a week behind chain-link fences in the processing center, which they referred to as la perrera, or the kennel. They slept on pallets that lined the concrete floor. Border Patrol provided medical care, but many of the children developed coughs, colds and fevers, migrants said. Jose Soriano, a 29-year-old farmworker from Honduras who was with his 3-year-old son, said the crowding grew worse during the three days they were held. “That’s why they sent us out so quick: No space,” he said agents told him. On Wednesday, he and his son made their way from the shelter to the bus station. They were headed to Atlanta to stay with a friend. They are scheduled to appear in immigration court there on March 27. Volunteers in the area are already accustomed to helping large numbers of newly released migrants. Elizabeth Cavazos, a leader of the migrant advocacy group Angry Tias & Abuelas of RGV, said ICE typically releases 300 to 500 migrants a day in McAllen. But additional releases in large numbers by the Border Patrol are likely to strain the system, she said. Homeland Security Secretary Kirstjen Nielsen was scheduled to visit McAllen Thursday. It is not the first time the federal government has released large numbers of migrants. During the Christmas holiday, ICE officials dropped more than a thousand migrants in downtown El Paso, straining local churches and nonprofit shelters, which had to pay to house migrants in hotels. Many more migrants remain in detention awaiting court hearings on asylum claims. Record numbers of asylum seekers have contributed to a backlog of 830,000 cases. In January, the Trump administration began forcing asylum seekers along the southern border of California to return to Mexico while their cases are pending, and on Wednesday it implemented the same policy in El Paso. On Friday, a federal judge in San Francisco is scheduled to hold a hearing on a lawsuit filed by the American Civil Liberties Union and other groups that argue the policy is illegal.